Hada in an undated photo. Chinese authorities in Inner Mongolia are continuing to hold veteran dissident Hada under "residential surveillance," even after his release from unofficial detention, a U.S.-based rights group said on Thursday. The long-serving ethnic Mongolian political prisoner was released by Chinese authorities on Tuesday to a police-owned apartment after spending four years in extrajudicial detention at the Jinye Ecological Park in the regional capital Hohhot, where he was being held after serving a 15-year jail term for "separatism" and "espionage." 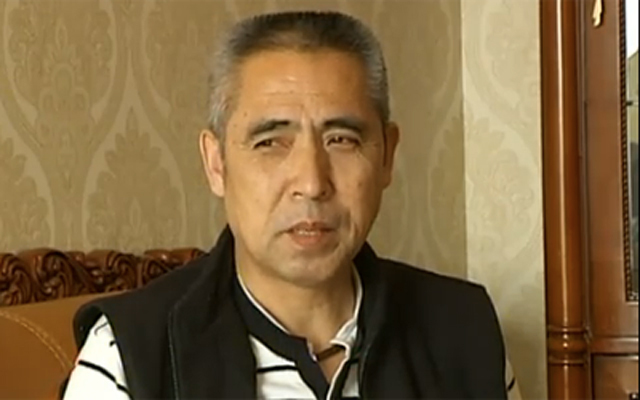 Hada, 59, was initially allowed to meet with his wife Xinna, son Uiles, brother Yushan,and sister Yuyue following his "release," although he had been living in the apartment since Nov. 17, the Southern Mongolia Human Rights and Information Center (SMHRIC) said in a statement on its website. The SMHRIC said the New York-based group had managed to contact Hada via Skype for an interview on Thursday morning local time, but that the interview had been curtailed. "The interview lasted only 15 seconds before the communication line was cut, apparently by the Chinese authorities," it said. Hada's family views his "release" as relatively meaningless, SMHRIC said. "Rather they consider this as another form of house arrest or the so-called "residential surveillance" under which Hada has no freedom of movement or assembly, no freedom of communication and no freedom of speech and expression," it said. "Although brief and sporadic meetings with family members and relatives are allowed under tight surveillance, no true family reunion has yet taken place in their own home." It said cable Internet and wireless network connections have been completely cut in Hada's apartment and throughout the surrounding area. "The same state security personnel who guarded Hada in the "black jail" are reportedly following Xinna and Uiles," it added. A text message from Xinna sent to SMHRIC, read: "On International Human Rights Day today, we are still having difficulty defending our right to communication and right to give media interviews." On Wednesday, Xinna told RFA she believed Hada's transfer to the police apartment was the result of factional strife within the ruling Chinese Communist Party. "Hada was detained [under the rule of former security czar] Zhou Yongkang," she said. Zhou is currently under criminal investigation for corruption, and was expelled from the party last week. "Now Zhou has been arrested, and I think that the central government should pursue whoever is responsible [for my husband's treatment]," Xinna said. Speaking to RFA shortly after his release on Wednesday, Hada described many years of torture and mistreatment during his prison term, and said his body is now "riddled with disease" as a result. He said the torture was aimed at making him admit his guilt, and vowed to sue the authorities for what he said was a miscarriage of justice. In Germany, exiled ethnic Mongolian activist Xi Haiming, who is known as Temcheltu in Mongolian, called on the international community to pay more attention to ethnic tensions in Inner Mongolia, which is part of China but borders the independent state of Mongolia. "Inner Mongolia has always been something of a forgotten corner of the world, from the point of view of the international community, but now it is getting more attention," said Xi, who is founder and chairman of the Germany-based Inner Mongolian League for the Defense of Human Rights. "Hada's 19 years in prison probably had something to do with that. So I think the international community should pay close attention to Hada's fate, and pay more attention to what he represents, which is the struggle of the people of Inner Mongolia for their civil rights," Xi said. Reported by Hai Nan for RFA's Cantonese Service, and by Tian Yi for the Mandarin Service. Translated and written in English by Luisetta Mudie.